Atlanta-based subsidiary of India’s Aditya Birla Group will add to its aluminum production capacity. Atlanta-based aluminum producer Novelis, a part of the Mumbai-based Aditya Birla Group, has signed a definitive agreement to acquire Cleveland-based aluminum producer Aleris. The announcement follows speculation reported earlier in the week by Recycling Today. The transaction is being valued at $2.6 billion, an amount that includes the assumption of some debt by Novelis. The current majority owner of Aleris is Los Angeles-based Oaktree Capital Management, which helped purchase the firm out of bankruptcy protection in 2010. In addition to owning Novelis, Aditya Birla also owns Hindalco, one of India’s largest aluminum producers. The Novelis bid for Aleris follows an unsuccessful one in 2017 by investors associated with Chinese aluminum producer Zhongwang Holdings Ltd.
to execute a fully debt-funded deal with leverage forecasted to peak below four times at closing, and provide a return to a multiple of three in about two years. If the deal is approved, Novelis will acquire Aleris’ 13 global manufacturing facilities. That includes melt shops that consume aluminum scrap in several locations, including in Davenport, Iowa; Lewisport, Kentucky; Uhrichsville, Ohio; and Richmond, Virginia. The acquisition also will include Aleris’ new automotive finishing lines in Lewisport, Kentucky, which has a significant amount of its 200,000 metric tons of capacity already under contract. The deal also includes 100,000 metric tons of auto capacity at Aleris’ facility in Duffel, Belgium. In addition, the deal will boost Novelis’ operations in China, according to the firm. Aleris’ Zhenjiang, China, facility is near Novelis’ existing Changzhou plant, which could provide greater opportunity for customer collaboration, says Novelis. 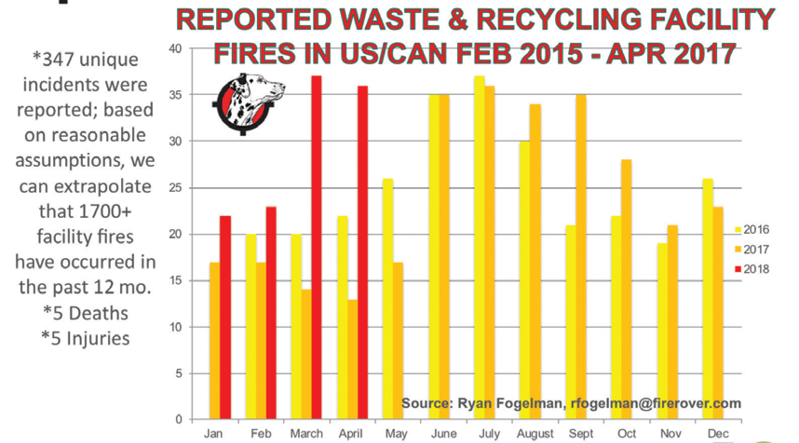 For the past three years, I have shared “The Reported Waste and Recycling Facility Fire in the US/CAN” data and analysis at WasteExpo fire safety sessions. Unfortunately, many of those who work in the waste and recycling industries have first-hand experience dealing with fires in daily operations. The causes of these fire incidents include traditional hazards like propane tanks, aerosol cans, fertilizers and household hazards, as well as new-era technology hazards such as lithium-ion batteries. Over time, the focus on fire safety has shifted from issues of compressed natural gas (CNG) tanks and hot loads on collection trucks to processing facilities, where there are more than 1,700 fire incidents annually. At waste and recycling facilities, dealing with these incidents is considered just “part of a day’s work.” Therefore, the only incidents to get reported are usually those that get past incipient or early flame stages, when the authorities are called to assist. In the past 12 months, news organizations have reported 347 fires in waste and recycling facilities in the U.S. and Canada. This is compared with 277 reported fires in the previous 12 months. More alarming is that in the first four months of 2018, there has been a 93 percent higher rate of reported fire incidents over the same period in 2017. While these yearly increases could be part of a normal cycle, they are indicative of an ever-growing number of lithium-ion batteries passing through waste and recycling streams, hotter and/or dryer environments and the increased inventory of waste being processed because of China’s recycling restrictions. How do we combat the problem? Education/awareness: The major shift that needs to take place is the perception of a fire incident being considered a problem inherent in the type of work done to an operational issue that can be fixed with better processes and procedures. 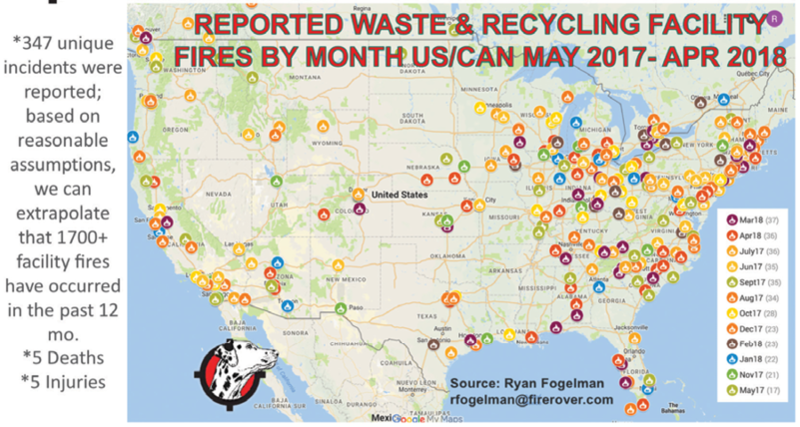 The waste and recycling leaders in the industry have changed their stance on fire incidents from one of nontransparency to the opposite, with some even sharing their fight with the public in hopes of changing customers’ curbside waste and recycling behavior. The industry needs to take two steps back to take one step forward. By sharing these types of struggles with the public, we begin the much-needed process of changing behavior. Operational best practices: No operator is immune to dealing with fire hazards as part of his or her job, but there are definitely steps people can take to mitigate risks. Brent Shows, the director of recycling for Advanced Disposal, Ponte Vedra, Florida, shared a number of operational best practices in a fire safety session April 23 at WasteExpo in Last Vegas. These included: stay in compliance with regulatory authority; do not park equipment near a potential heat source; implement a preplacement plan with local fire departments; if available, verify and maintain existing automated suppression systems; if facility is not protected, source an additional layer of protection; schedule fire watch with local security company if necessary; develop action plan should an event occur to limit confusion and facilitate information flow; and most importantly, basic housekeeping to limit dust and material from being the fuel around a spark. By observing these practices, educating staff and investing in technology, Shows said that Advanced Disposal has had an amazing turnaround in reducing the number of fires it was seeing just three years ago. Technology: When it comes to making an investment in safety technology, it is sometimes easier to remain in the status quo and continue to do only what is required, especially in the fire safety space where there are minimum standards mandated by the National Fire Protection Association (NFPA), Quincy, Massachusetts. The standards for sprinklers and fire extinguishers work in many occupations, but in the waste and recycling industries, bare minimum safety measures are not enough to proactively protect from everyday hazards. For example, there can be problems in a nonenclosed operation that is housed in a warehouse with 30- to 70-foot ceilings when the only means of protection depends on radiant heat triggering a sprinkler head. This is a reactive solution that typically does not begin to work until the incident has had time to develop. Additionally, this traditional solution comes with the need for cleanup, resetting of the system and several other hassles and headaches. Many waste and recycling facilities also have outdoor operations to consider that typically have very little, if any, fire protection equipment in place. For these reasons, new technologies are required to address fire issues at the source. Fire Rover, Southfield, Michigan, has shifted its focus from technology that’s designed to contain major fires to early detection and cooling. This includes the integration of new applications of military-grade thermal detection, remote human verification and on-site remote targeted application of the system’s cooling wetting agent. The system is currently being used to protect facility tipping floors, in-feeds, equipment, feedstock piles, scrap metal, organics, waste-to-energy facilities, hazardous materials and more. The important thing is that these types of technologies can be used as a tool to complement the systems that safety and operations teams have developed, maintain and continuously improve upon. Imagine if a surgeon only had humans (without the additional help of technology) available to keep a patient alive during a surgical procedure. Surely, the percentage of incidents during surgery would increase. Fire detection technology works the same way. In order to compound the level of safety within organizations and help environmental, health and safety staff reach their goal of preventing major fire incidents, technology has to be used in tandem with improved processes to mitigate risk. With the risks of inherent fire increasing, facilities need to develop and install solutions that can mitigate fires as early as possible, especially when the materials processed in the waste and recycling industries are becoming increasingly volatile and unpredictable. Using a combinational approach predicated on protection, education and refined operational procedures can transform a reactionary company into a proactive one—two different approaches, two vastly different outcomes. Ryan Fogelman is vice president of strategic partnerships for Fire Rover, Southfield, Michigan. He has been compiling and publishing “The Reported Waste and Recycling Facility Fire in the US/CAN” since February 2015, the “Waste and Recycling Facility Fire Annual Report” and speaks regularly on the topic. He can be reached at rfogelman@firerover.com. The workshop is part of a nationwide series that will address recycling market developments. The National Recycling Coalition (NRC), Lafayette, Colorado, has announced that it will host the second workshop in a nationwide series meant to address recycling market development. NRC says it is hosting these workshops to allow participants within each targeted region to learn how to attract and develop new and local markets for recycled materials, improve the quality and quantity of those materials and increase efficiencies. The second of these national workshops, Recycling Markets Development in the 21st Century, will be held in Atlanta on July 31 from 9 a.m. to 4 p.m. Presenters from the private and public sectors will be in Atlanta to look at public-private relationships that advance and enhance collection, processing and end use in the region. These national experts will work together with local governments and all sectors within the recycling system to focus on improving efficiencies throughout and ensuring high-quality materials to end markets, NRC says. The State of Texas Alliance for Recycling says it has adapted its mission and structure to accommodate changes in the global market. The Austin, Texas-based State of Texas Alliance for Recycling (STAR) has adopted a new mission: to advance recycling through partnerships, education and advocacy for the benefit of Texas. This new mission is intended to develop and support the domestic recycling industry considering the recent National Sword import bans on certain recyclable materials into China, the organization says. “We have changed our mission statement as well as our funding structure to provide clarity of our goals and add more value and benefits to our mission partners,” Jordan Fengel, executive director of STAR, says. STAR says it also shifted from its former structure of having mission sponsors and will now have mission partners, which are cities, businesses and other entities who support the STAR mission and vision to advance recycling in Texas. There will also be different levels of mission partners with its own set of benefits, including sponsor opportunities at the annual Texas Recycling Summit. More information about new partner levels and benefits can be found on STAR’s website. STAR hosts various events on several industry topics throughout the year, including two annual conferences. Acquisition combines two briquetting system manufacturing companies. Zaisertshofen, Germany-based RUF Briquetting Systems has announced the acquisition of C.F. Nielsen A/S of Baelum, Denmark. The two companies will continue to operate as independent firms and the management of C.F. Nielsen will remain in place, according to a RUF news release. The two brands RUF and C.F. Nielsen will remain, but management will focus on combined marketing efforts.